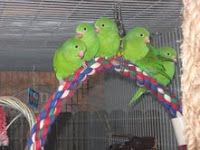 Meet the newest residents at Parrots First. 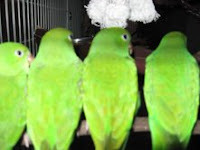 9 Canary Winged Parakeet babies. These babies fell from trees in different locations and were hand fed by Valley Wildlife Care Center volunteers. Now they are flying in an aviary to get ready to hopefully join their flocks. This entry was posted on Tuesday, June 2nd, 2009 at 7:49 pm and is filed under Birds. You can follow any responses to this entry through the RSS 2.0 feed. You can leave a response, or trackback from your own site. 18 queries in 0.111 seconds.